Saturday, Chris and I hiked out along the beach to the Starbucks at Primrose Valley. The tide was still out when we left Filey but had come in considerably when we retraced our steps back into town afterwards. We had to dodge a few rain showers too as the weather seems to have turned a little cooler these past few days since the kids left for home. We ran my mother into B&Q in Scarborough in the afternoon so she could order some large planters to repot some of her camellias in the backyard. The Primrose Valley caravan park was quite busy but then most are on weekends in these parts. The caravan park on the cliff tops in Filey is usually filled to capacity on weekends and then empties out late Sunday afternoon as families have to get back to work on Monday. For our North American RV friends, most of the caravan parks we have seen over here offer 15 amp electricity, some sites have running water and very few have sewer hookups at the sites but do offer dump stations. We did see a 38 ft Mountain Aire towing a car on a trailer on the road north of Whitby the other day. Apparently, it is quite common for UK RVers who have spent time RVing in North America to import their rigs back into the UK. I expect that considerable modifications must be done to the electronics, etc though. We met my cousin Jonathan and his family in Pickering for lunch today. 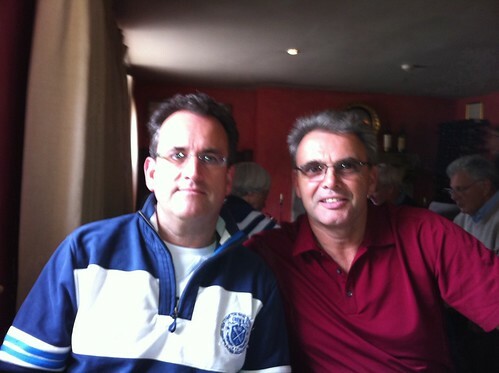 Jonathan was celebrating his 50th birthday with a trip to Yorkshire. We enjoyed a lovely lunch at the White Swan and before we knew it the afternoon had disappeared. It was great catching up after all these years. 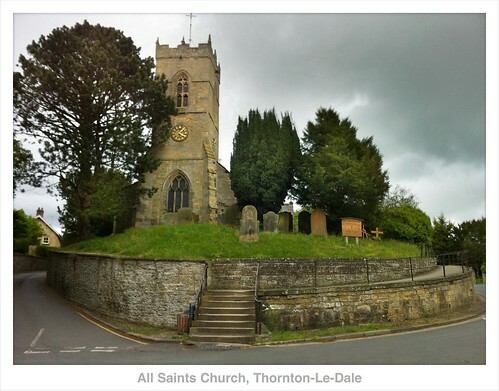 We stopped in Thornton-Le-Dale for an ice cream and a walk. My dad used to love coming here for the best homemade ice cream in Yorkshire. Inge had a tub of his favorite flavor, rum raisin while Chris and I settled on smaller sized chocolate and black cherry. 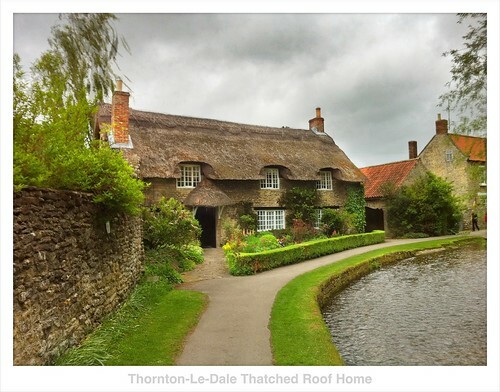 The other reason we stopped here is so we could have another look at a thatched roof cottage just off the main road through town. Chris loves this cottage and I’m sure you can see why. We had a light supper at home and I finally have made some considerable progress in reading Dan Brown’s, The Lost Symbol, on my iPad 2. It’s still a novelty for me reading books on my iPad 2 using the Kindle app. Chris flies through books on her Kindle. I’m okay reading magazines but for some reason books seem to be more of an effort for me on the iPad. I’m getting there…..slowly. I’m not real impressed with our rental car. It has performed well enough but readers may recall we had a bit of a go around with Thrifty in Birmingham when we arrived to pick up our rental. To recap, we ordered a VW Passat and they tried to stiff us with a VW Golf instead, smaller car for the same price. With Jim’s able assistance, we managed to get a comparably sized Ford Mondeo instead. The car runs well but the RF tire has a slow leak so I am having to add air to it all the time. Today, while filling the tire, I noticed some nice scratches on the wheel well above the tire where someone’s car door has carelessly touched our rental. Given my luck with Thrifty, I expect they will want to charge me for damages now too. Hoping to try to buff it out before we leave here. 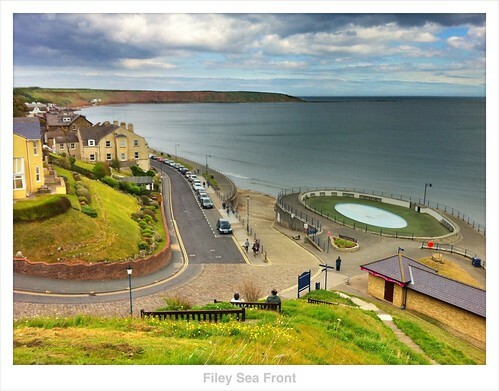 This entry was posted in Photography, uk, yorkshire. Your photos make me feel as if I'm there with you. Delightful! Really like the cottage picture.